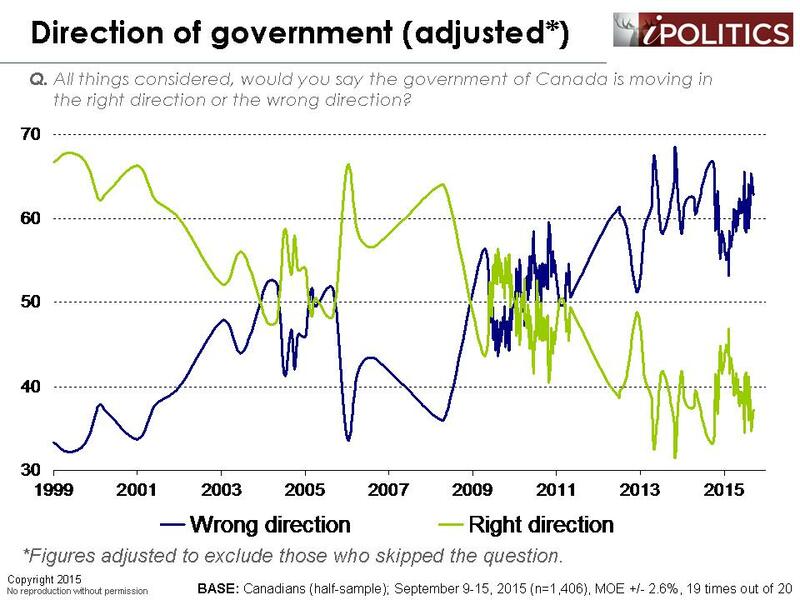 [Ottawa – September 17, 2015] As one of the most protracted campaigns in political history lurches to the midpoint, it might be helpful to take stock of what we know. We begin by noting that we don’t have much idea of what to expect on October 19th, but we do know a few things not to expect. We also have a clearer idea of the key forces that are underpinning voter choice (and which ones aren’t). It is also clear that some of the confusion in understanding what is going on results from a profound cleavage across those supporting the incumbent and all other voters. This chasm is expressed demographically and in terms of key issues and core values. Let’s begin with a snapshot of where voters are right now. What is immediately evident is that whatever the campaigns have accomplished to date, they have not produced any real guidance about the final outcome. If anything, the picture is muddier now than at the outset of the campaign. The NDP has come down modestly, the Conservatives are stuck sub-thirty, and the Liberals have established a stronger presence than they did at the outset of the campaign. We basically have a three-way tie with some evidence of momentum favouring the Conservatives right now. It also appears that it is highly unlikely we are going to see anyone breaking away from the field and winning a majority. The Conservatives are ten points back of their 2011 result and while the NDP and Liberal Party have both flirted with majority territory over the past year, they now seem locked in a churn of promiscuous progressive voters seeking relief from the Conservative era. We would also add that desire for change is stronger than in the last three elections and approval of current trajectories of the country government and Stephen Harper all are considerably more challenging than in 2011. In terms of issues, it really is the economy, stupid. Whether it is the short-term malaise and R-word or deeper long term anxieties about the end of progress and the erosion of the middle class, the economy has eclipsed all other issue as the campaign has matured. We don’t see any party having carved out high ground on the pinnacle issue yet, but the Liberals have definitely moved very much back in contention on the strength of much improved credibility on the economy. Why has this happened? It appears that one of the ballot booth issues that is swinging voters is the role of the federal government in both stimulating the economy and insulating citizens from the effects of a weak economy. It appears that the Liberals’ decision to abandon the commitment to (immediately) balancing the budget and using borrowing to invest in major new initiatives is striking a resonant chord with non-Conservative voters. Whereas the Liberal positioning on C-51 probably left them offside with progressive voters and bolstered Thomas Mulcair’s fortunes, the newly different positions on balanced budget may be reversing some of those gains that the NDP secured. On top of all of that is the Conservative Party’s trumpeting of its newfound surplus. There is no apparent immediate read on this (although the Conservatives moved up in our last two nights of polling) and the impacts of this are unclear. Conservative voters certainly place a much higher priority on balanced budgets than the centre-left spectrum at this time. This has left Mr. Mulcair in the challenging position of explaining where the revenue will come to fund his version of a progressive agenda and to get a moribund economy moving again. This issue will unfold with clearer trajectories in the coming weeks but it is interesting to see the initial impacts. It is interesting to note that the voter interest in public accounts is extremely modest at this time outside of the Conservative base. It is therefore ironic that it appears to be a significant sorting mechanism at this time. While voter preoccupation with the economy is unlikely to dissipate it is possible that values issues and culture wars could become a major additional factor. The Syrian refugee crisis has had a huge media impact, but frankly the impact on the political landscape is difficult to discern and very inconsistent with the initial pundit consensus that this was a huge pratfall for the Harper government. In fact, the tacit and explicit values messages may have shored up the Conservative base. Somewhat surprisingly, the progressive and moderate parties of the centre and left have had less success in emotionally engaging their voters through an appeal to the threat to the dominant values of the rest of the political spectrum which are so scantly acknowledged in the Conservative agenda and rhetoric. A looming vision & values war? We see a huge fault line across older and younger Canada on this and related issues such as austerity versus investment. The values and issue preferences of the older, less educated constituency for the Conservatives are profoundly in tension with the values of the rest of the population. The ‘obviousness’ of the need to shift from a military focus to a humanitarian emphasis is completely alien to the thinking of Conservative Canada. And how about that ethics thing? Clearly, ethics can move voters as Harper must remember as it was his promise to restore ethics and accountability (following the Sponsorship scandal) which redrew the political landscape in Canada. It is therefore passing strange that there is no lingering evidence of fallout from the Duffy affair for the incumbent. This may change and the critical mass point of anger and regime fatigue may be passed as the campaign matures. But so far, it hasn’t and we wouldn’t rule out that a deeply mistrustful and skeptical electorate have become so inured to such problems that they just aren’t registering in voter choice. The campaign to date is showing some clear and interesting patterns in terms of demographics and regions. 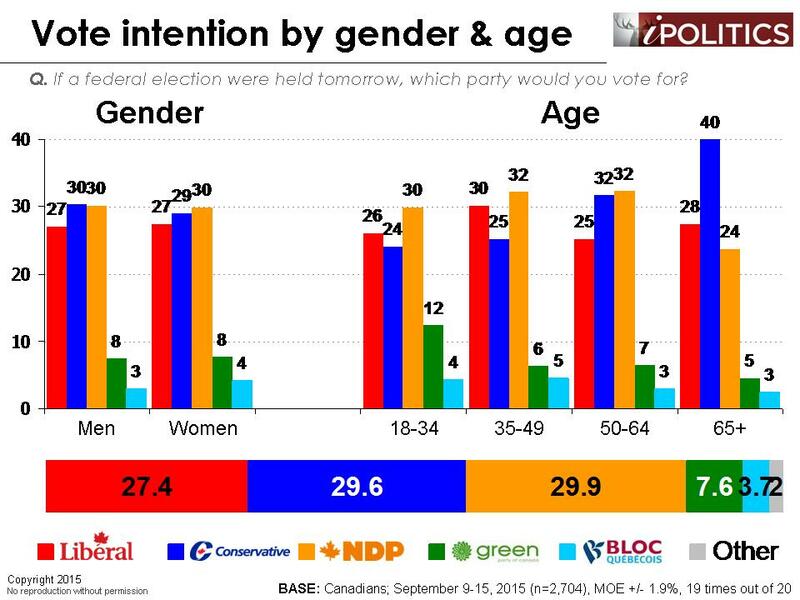 The largest demographic split is the older versus younger Canada which is keeping the Conservative Party in the game. 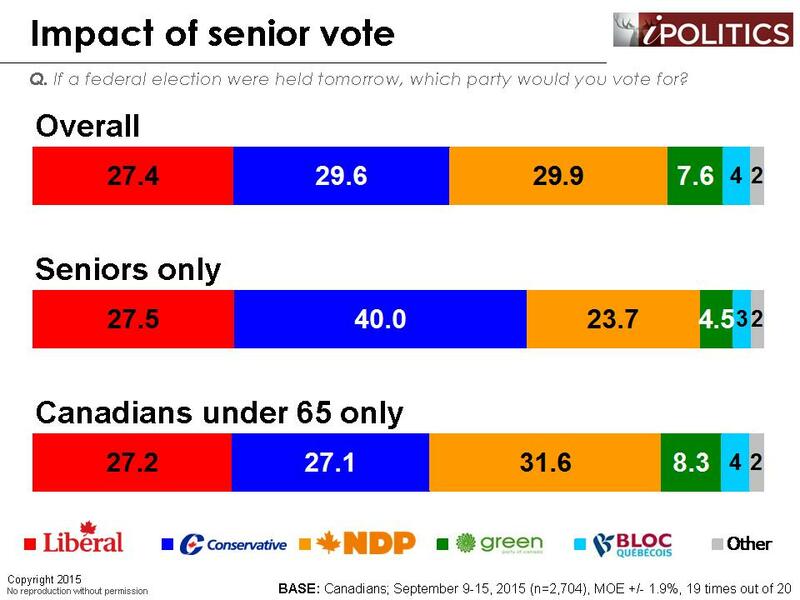 If voting were limited to seniors, the Conservatives would be well within reach of a majority. Without it, the Conservatives would be five points back and facing political disaster. They are, however, voting and this group will be critical to watch. The other critical divide is across university educated and less educated Canada. 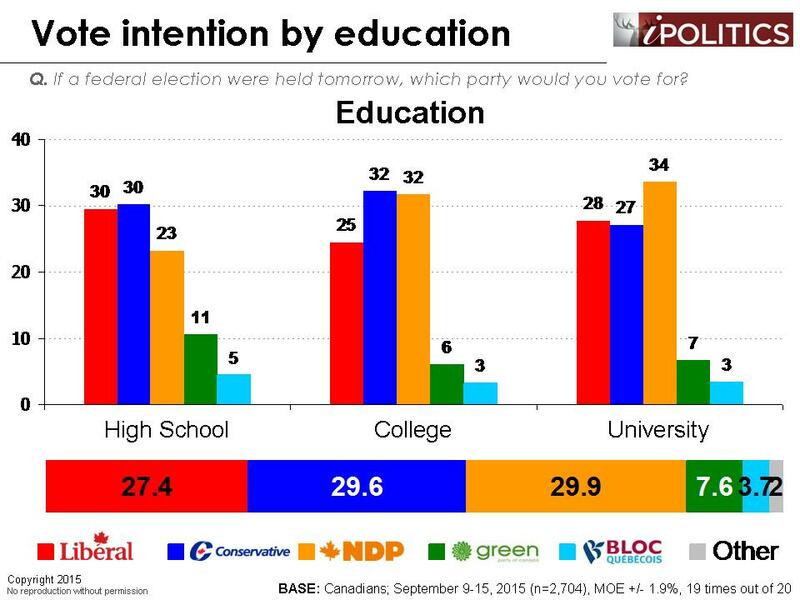 In addition to appealing to older Canadians, Stephen Harper has much stronger appeal to the less educated. Some of the sharpest value disputes are across this divide and the latte-sipping professional class are extremely unhappy with the national direction charted by the Harper government. This is certainly true on immigration and refugee determination, but also a range of other issues. The indifference – and perhaps hostility – to science and reason evident in the party’s positioning may work with their base, but may have provided fertile ground for an appeal to the threats to the values of the moderate and progressive majority in Canada. The regions are quite different for the most part. Atlantic Canada is really fatigued with the current government and leaning strongly Liberal but the NDP have live prospects as well. Quebec is the most settled and least engaged region. 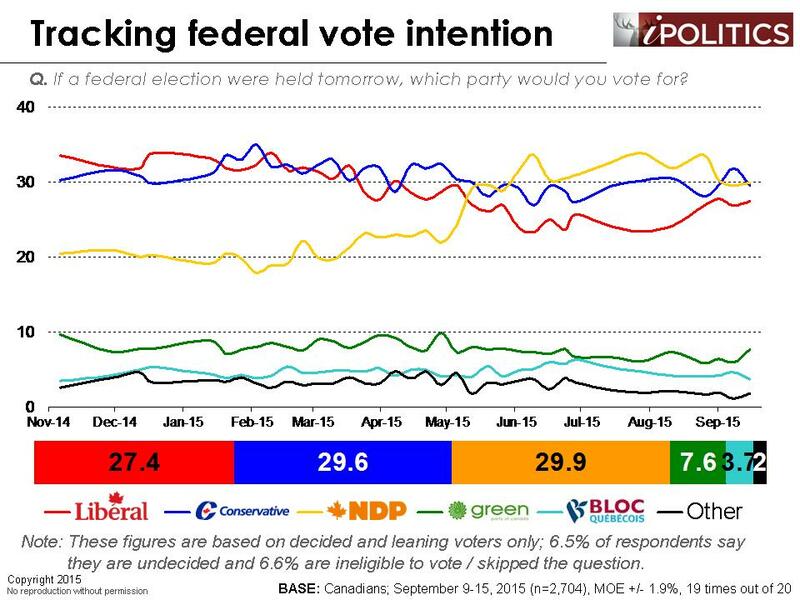 For now, it looks like a lock for the NDP, although the Liberals are showing some modest signs of life after a near-death experience. Ontario is the least predictable and most important race; the Liberals are doing better here but this is really a tight three-way race with huge vote splitting implications. Alberta may be showing some buyer’s remorse with their new provincial government and the Conservatives have a huge lead there. 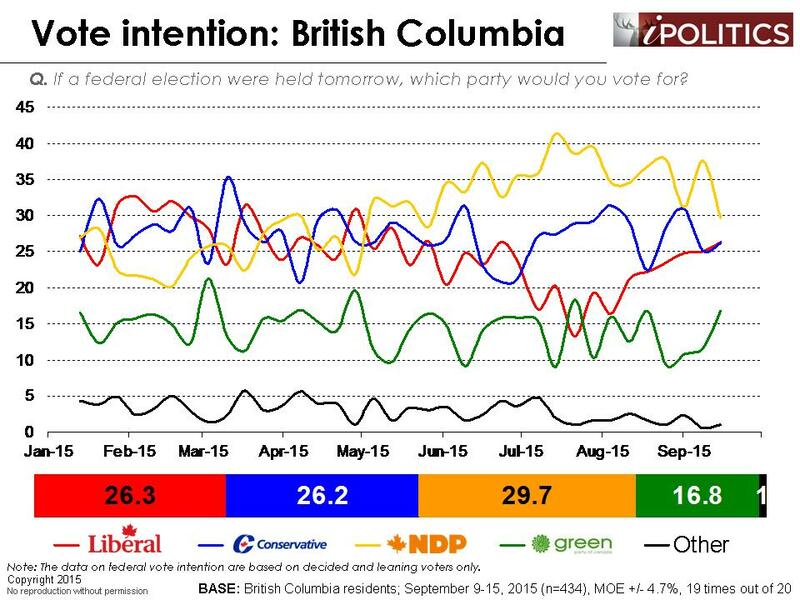 British Columbia is a very interesting three-way race (and, in some ridings, a tight four-way race). Voters could be waiting for the unpredictable outcome of British Columbia to settle what looks like a very tight federal election. One interesting and potentially important new finding is that the self-rated certainty to vote is now higher among those who have cut their land lines. In 2011, to our chagrin we found out that cellphone-only citizens shared two characteristic: 1.) lower tendency to select the Conservatives; and 2.) lower tendency to vote. These two factors coalesced to produce a larger prediction error. 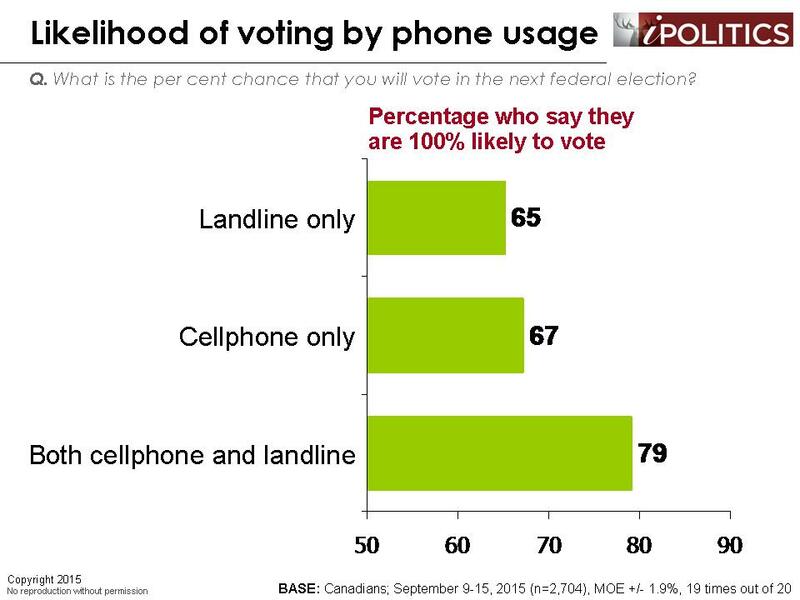 This time out, the much larger cellphone-only population is still much less likely to support the Conservatives. They are, however, more likely – not less likely – to claim that they are certain to vote. This could be a critical factor in the final outcome. The election is utterly unpredictable right now. No one has cracked the master issue of the economy to this point in time. 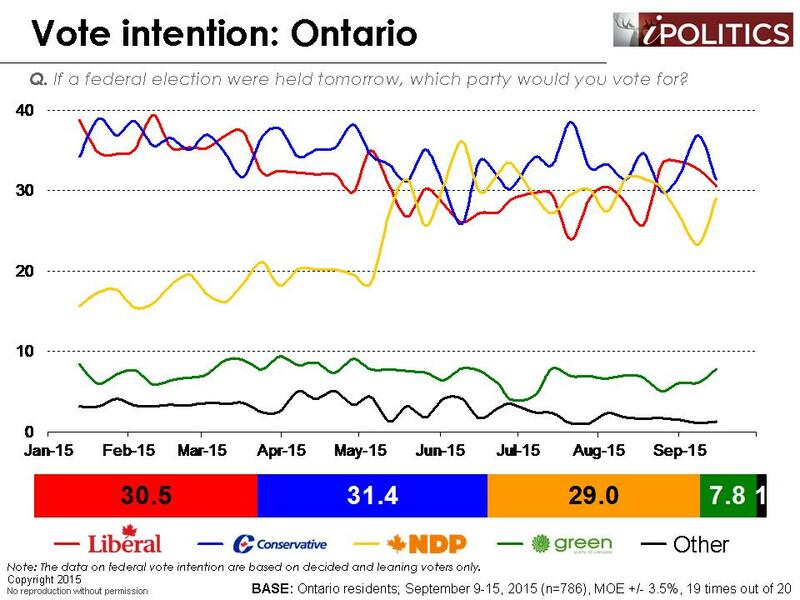 The Liberals are back in the game but the NDP are also much better positioned now than they were at this time in 2011. It doesn’t appear that ethics and regime fatigue are as critical issues as some have thought. It is possible that the campaign will broaden to highlight the formidable faultiness dividing Conservative and progressive Canada. The Conservatives are certainly hanging in but they have the sternest set of challenges to victory, and they need a majority or near-majority to continue given the adamant desire for change in the rest of the electorate. We will probably hear more about coalitions, particularly if the campaign remains this unprecedented three-way log-jam. So this is shaping up to be a pollster’s nightmare as we follow the long trail home to Election Day. Best bets now are a minority of some sort. The field dates for this survey are September 9-15, 2015. In total, a random sample of 2,704 Canadian adults aged 18 and over responded to the survey. The margin of error associated with the total sample is +/- 1.9 percentage points, 19 times out of 20. Harper won the debate clearly! Harper 2015! Steve, don’t be so sure… Harper has sold Cananda’s resources to foreign interests. Our middle class is struggling trying to juggle jobs, taxes, children and aging parents with cuts in every public sector. Canadians are losing productivity because we are stuck in traffic. Crime rates in cities are rising. Our Canadians values (environmental, Humanitarian, etc. )has gone down the tubes internationally. The rich Canadians are great at hiding their assets overseas… 10 years ago, Canada was 1st on the UN OECD index which measures happiness, quality of life…Now it has fallen to 8th place. 1/10 Canadians are living in poverty. Harper and the American war machine have destabilized the Middle East and created this humanitarian crisis. 36 millions & 60 millions who died (WW1 & WW2) would have died in vain for this Bill C-51, fabricated terrorism by the Bush Administration. Pentagon’s 4 Star general, Wesley Clark, has spoken the US’ part of a 5 year campaign plan, “… to take down 7 countries, beginning with Iraq, then Syria, Lebanon, Libya, Iran, Somalia and Sudan.”https://www.youtube.com/watch?v=f7NsXFnzJGw&list=LLgO1R0wdvs_6q_jmALNSzkw&index=6. Should we put our tax payers’ money into financing wars that kill civilians worldwide while putting our women, children and elderly into poverty and people on the streets????????? Thanks for labeling people. It helps us figure out who is on the side of right and wrong. I see all. Trudeau came out hard and angry. He had spirit and openly challenged Harper repeatedly by saying “That’s NOT true Mr. Harper”. Trudeau called him out many times. Harper had NO answer. Harper did absolutely nothing but mutter and stammer his old stand-by lines. One wonders who really is his base? Dead bodies? People with alzheimers? He impressed nobody. His sweaty, creepy grin made him look disingenuous. His remarks about “Old Stock Canadian” riled me. This is a man who supported the Northern Front in the 90’s. Horrible. Mulcair came out cool and professional. He was very believable but should have spent more time attacking Harper instead of Trudeau. The moderator was atrocious. Whoever decided to put him there should be fired. A wooden, stoic fool. 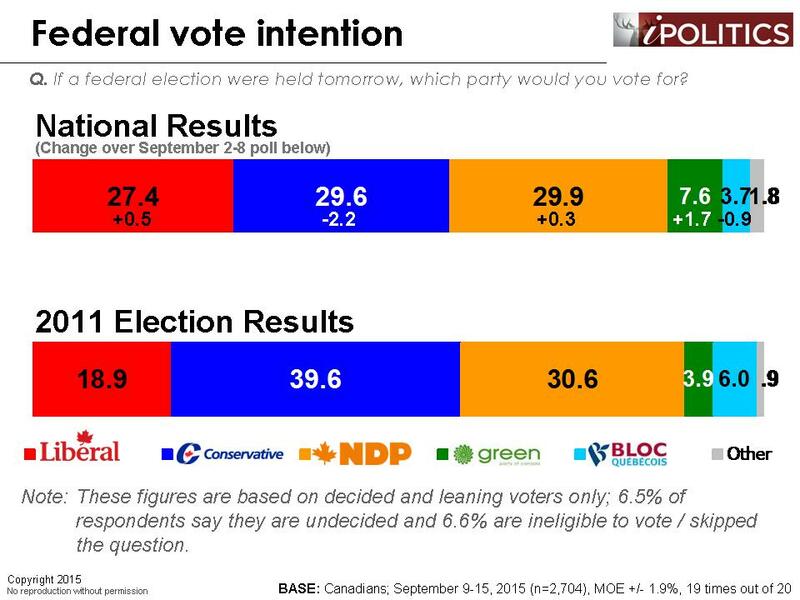 The NDP, their Leader and their POLICIES definitely won the Political Debate on Sept. 17/15 ; and will WIN the Federal Election by a vote percentage of about 43% . Time for change ! Time to face reality! TIME TO VOTE NDP for the BEST Government ever in Canada ! Your right it is time for NDP to be government I’d love that idea it won’t happen conservatives with voting law rigged the election. WOw it would be good for the fear monger to be out of government. I think that Mr. Mulcair has some new ideas and a committment to fairness for all Canadians and political experience. It was obvious that Mr. Harper intends to keep on keeping on with failed economics, and giveaways to corporations without any agreement to provide jobs for Canadians. And Mr. Trudeau came across as scattered. We need to return to fairness, ethical behaviour. We need to return to Canadian values . The NDP are centrist, are social democrats, NOT socialists. 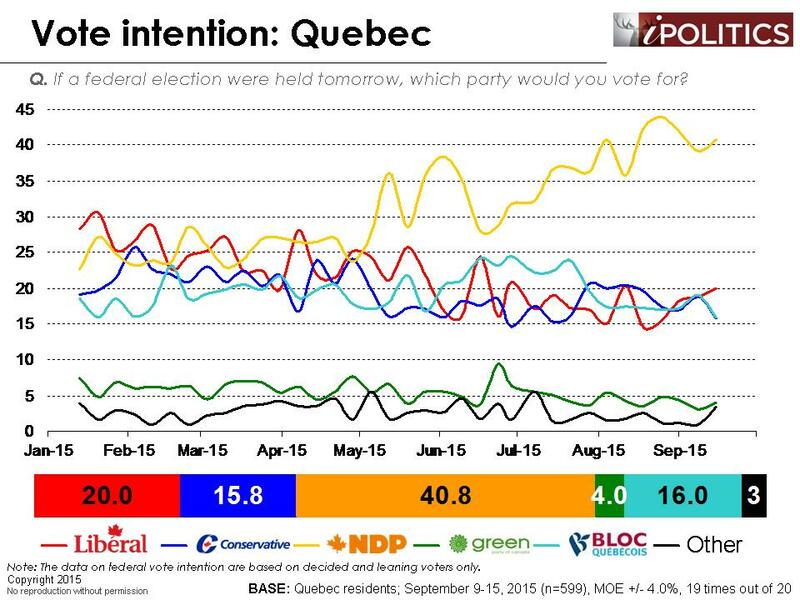 Let’s give Mr. Mulcair a chance ! The election is still one month away, and one month is forever in politics, especially during an election campaign. Frankly the analysis seems shallow and uninformed – distinctly conservative leaning. On the topics of C-51, omnibus bills, what conservatives call “leadership” (i.e., PMO-driven), environmental issues, Canada’s international role (military vs diplomatic), immigration, Senate reform, working with the provinces – barely a mention, but those are key issues that informed voters decide on. Sadly too many voters decide on media perceptions. “Stephen Harper isn’t perfect, but when…” – the best propaganda money can buy. A disturbingly superficial analysis. This is far more likely just an indication that the conservative vote in Alberta is not split federally like it was for the last provincial vote in that province. The disturbing part comes from the fact that even a group like Ekos that lives and breathes politics seems to be reflexively making the common and dangerous conflation of a political majority (most seats) with the popular majority (most votes). 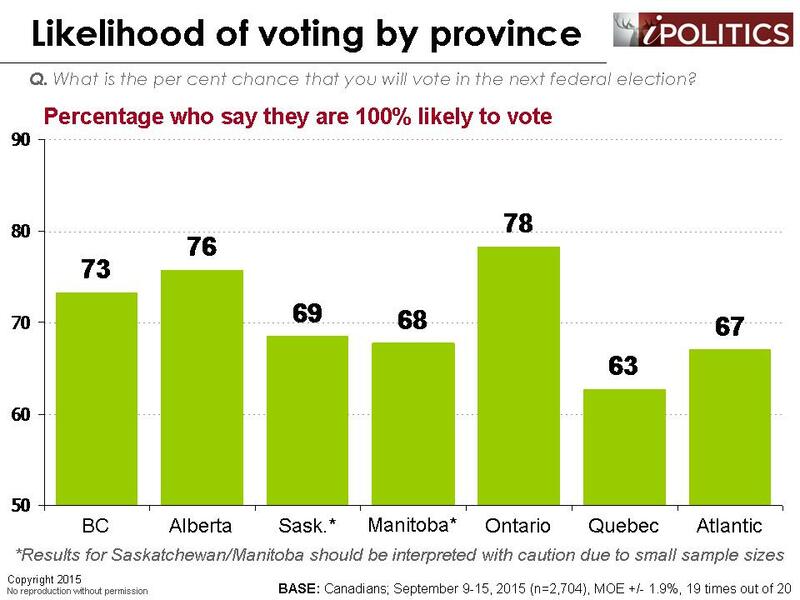 The majority of Albertans never wanted the NDP provincially. And yet the NDP holds the majority of the seats there. It seems like hair-splitting to some I’m sure, but it is a really important distinction and not using it is more than just sloppy thinking. It can help misrepresent what is happening or has happened and in that way help mislead yourself or others.